Said to be the state of Ohio’s oldest inn and quite possibly its oldest continuous business, the Golden Lamb benefited from its position on the highway between Cincinnati and Columbus. Today it offers travellers 18 guest rooms and a popular restaurant. 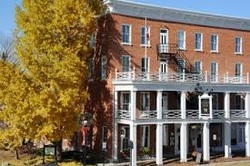 Since being established in 1803, the Golden Lamb has been visited by no fewer than 12 U.S. Presidents including Garfield, McKinley, Adams, Harrison (B), Harding, Taft, Harrison (W.H. ), Grant, Van Buren, and Hayes. It has also been patronized by some of English literature’s most notable figures including Charles Dickens and Mark Twain.